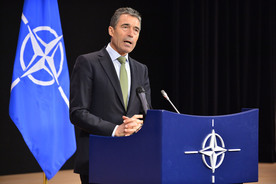 Brussels, Belgium: The NATO Secretary General, Anders Fogh Rasmussen, will visit Washington, D.C. on Monday 7 and Tuesday 8 July, and San Francisco on Wednesday 9 July. On 7 July, the Secretary General will deliver a speech at the Atlantic Council of the United States entitled “A Strong Transatlantic Bond for an Unpredictable World”. The Secretary General will meet the President of the United States, Barack Obama on 8 July. On 9 July, Fogh Rasmussen will deliver a speech entitled “America, Europe and the Pacific” at a public event co-hosted by the Commonwealth Club, World Affairs Council of Northern California and the Marines’ Memorial Association at the Marines’ Memorial Club and Hotel in San Francisco.